The Kalos Universe is the shared fictional universe where most comic book titles published by Kalos Comics take place, including those featuring Kalos' most familiar characters, such as Paragon, Swan, and the members of Vanguard. 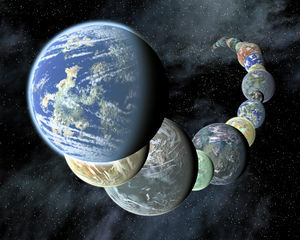 The universe of Earth-0 has no particular significance in comparison to that of Earth-1 or any other universe -- the name is simply a convenience. A more technically accurate nomenclature would define the "Kalos Universe" in terms of its "location" in the multiverse within 196,883 dimensional space. Since this would require the listing of 196,883 coordinates, "Earth-0", "Earth-162", "Earth-4661", etc., is a convenient shorthand. This page was last modified on 30 May 2014, at 12:42.